April showers brings May flowers. I set this table up below and that very same night, it rained. We need the rain, so it was welcome. This is a deck off our study. We have french doors that open to this setting. Our study is where my husband and myself have our computers. I started this table with a fushia tablecloth. I love using our cabbage plates. My Mother came over, so I could perm and style her hair. I am a former hair stylist. My Mother loved this tablescape and enjoyed the nice lunch I prepared. I made Banana pudding for dessert. I forgot to take a photo again. 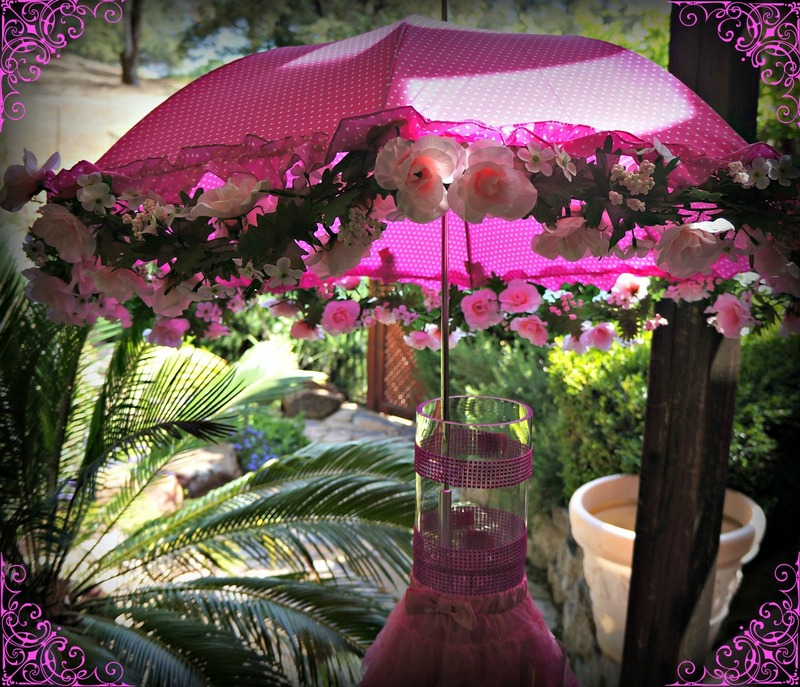 I dressed a pink polka dot umbrella with a rose garland from Michaels. It sits in a tall glass vase with a toddler's pink lacy skirt. I also added a pink jeweled ribbon. 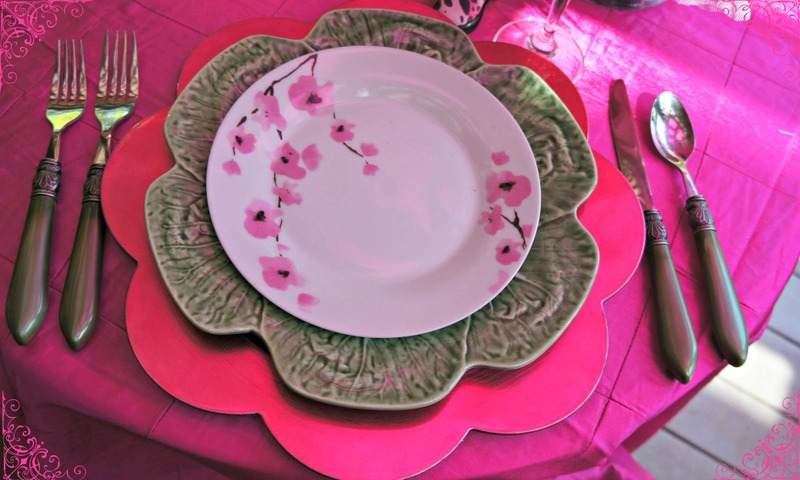 Hot pink flower charger with the cabbage plate. The pink floral salad plate is from Ross. Gotta love that store! Green flatware is from Horchow. 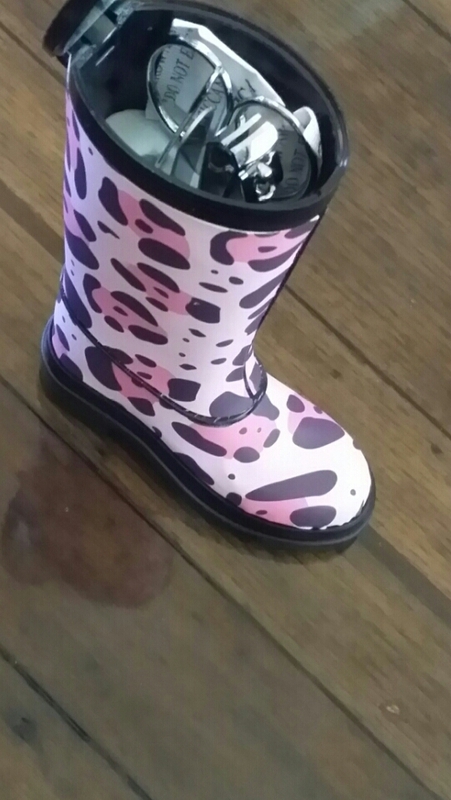 The cutest little pink and black rain boot favor. The boot is actually a manicure set. My Mother was surprised when I opened it for her. My husband created a paved path to our garden. He is staining it today. I shall be posting this soon, along with our garden photos. Have a great week. Sorry I haven't posted in awhile, we have been busy taking care of our oldest dog, Sasha. She was drinking a lot of water and quit eating. She is 15 1/2 years old. We took her to the vet almost everyday. They did several blood test and also Cushing's disease test. Daily, we took her for fluid IV's. She had a tooth infection, so she is on antibiotic. She doesn't have Cushing's disease. She is feeling better and started eating again, but not as she used to. We are keeping our fingers crossed Sasha will feel better. At her age, one never knows how long they will live. One of my favorite photos of Sasha. She loves to be in the pool, when it's hot outside. She doesn't feel comfortable swimming around, so I place her in a baby float. Praying Sasha gets to feeling better. Love the picture of her floating in the pool!! Our Cairn loves the sprinkler. Gorgeous table setting. 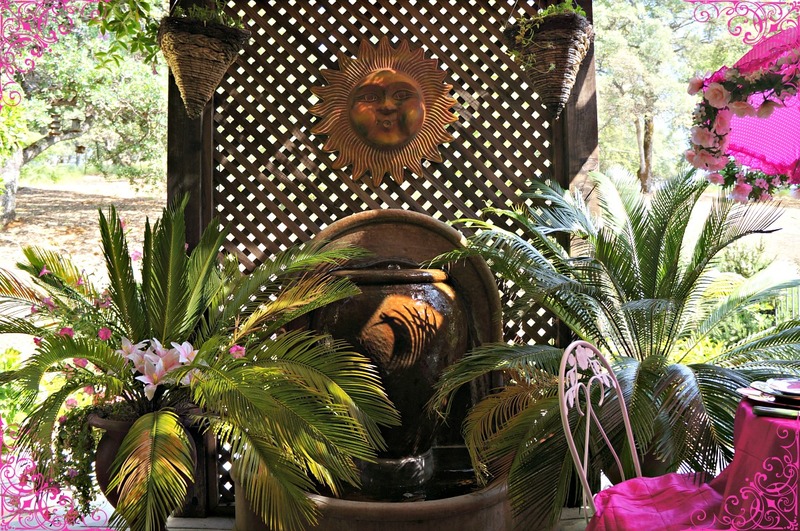 Cannot wait to see more photos of your beautiful gardens. Always so inspiring. OWwwww so sweet Sascha ..hope she feeling better soon...our iris is also almost 15,5 ...we have also troubles with her every day...so sad ...lovely week love Ria...x! 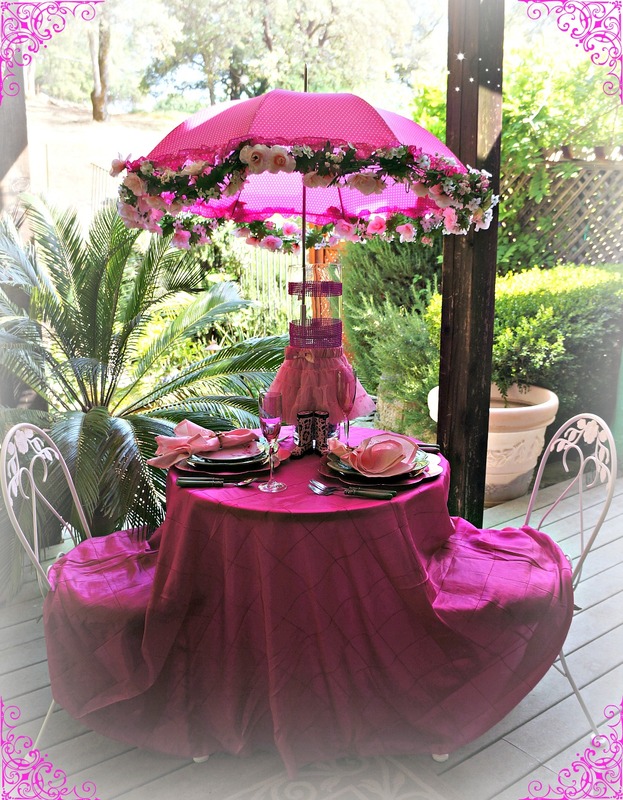 Love your pretty table vignette and the umbrella with flowers is adorable! So glad Sasha is feeling better. My fur babies were seventeen when they left me so there's still plenty of happy adventures ahead for her. Poor doggie..but great parents..and even better vet. I saw Spring today at last..no leaves yet..but warmer temps and we opened up the screened-in porch. That IS a sign of Spring. She is lucky to have you..and a pro at that! Hope your little Sasha continues feeling better each day. Hopefully she gains her appetite back, and best wishes! Linda, your photos are lovely! I will keep Sasha in my prayers. With a tooth infection no wonder she wasn't eating! Hope Sasha gets well soon and regain her appetite. You have a beautiful garden and you have done a lovely job with the pink table. What wonderful caregivers you are to your dear Sasha. I hope that she continues to feel better. Your April Showers table is so pretty, Linda. I'm sure your mom felt special to be a happy guest at your table, and especially to receive lunch, a perm and the sweet manicure set. Hi Linda, so glad that Sasha is doing better. How cute she is in the pool. What a special table setting for lunch with your mother. Love those sweet rain boots. You make everything perfect my friend. Have a great day. Aww poor baby- I hope she will feel better soon. It's tough to see them go down hill. She's adorable floating in the pool. The table setting is so cute and girly! I think that's great how you did your mom's hair. My sister Jen is a hair dresser and Mom sees her once a week. Those rain boots are too cute especially with their little secret! Take care and enjoy your gorgeous weather by the pool! First off I have to say ypur Sasha is adorable! I hope she is feeling better each day. Such a pretty table Of courset your Mom loved it. Love the boots & the umbrella. Hello lovely lady! It's always a delight to visit your pretty blog, Linda :) And speaking of pretty, your tablescape is simply lovely! The pink is so cheerful and bright, my friend. I felt like I was in Hawaii with the color and greenery surrounding the table. Your Sasha is just precious and I truly hope she feels better as each day goes by. Hugs to you! Thank you for sharing with Roses of Inspiration - it was a blessing to have you at the party. 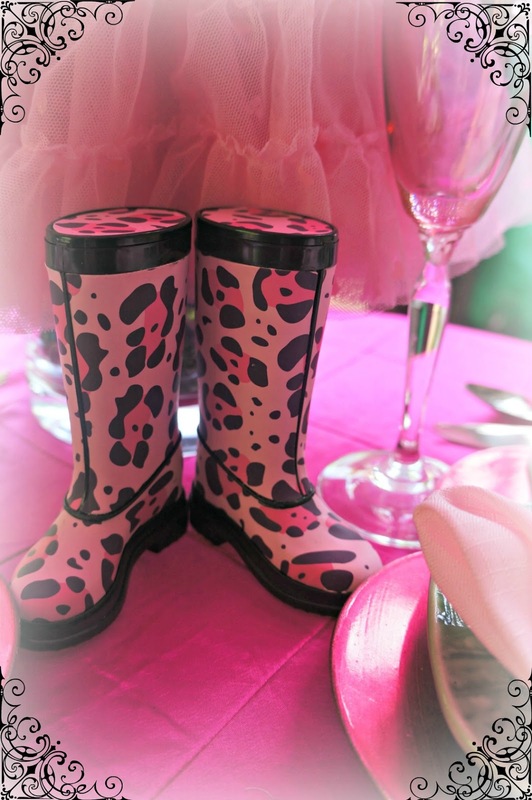 What a sweet table - love the frilly umbrella and those boots - how clever! What a beautiful table and beautiful setting for it. Couldn't be more lovely. I hope your dog is feeling better each day. We love dogs here at my house. Couldn't be without one. Take care. Valerie R.
Your table is beautiful and SO creative!!! A child's lace skirt!! Who would have thought?? It's hard to see our pets age and suffer just as our older family members do. Good morning sweet Linda! I am late....school is so demanding of my time, but I so love to visit you. Sure hope Sasha will be feeling better soon. 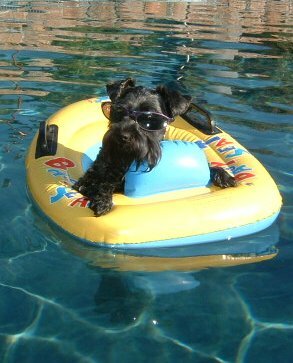 Love the photo of her in her float boat! Lovely tablescape, Linda! Looking forward to seeing your garden. It is so sad when a loved pet's health is failing. Years of love and devotion fill your heart with so much emotion. 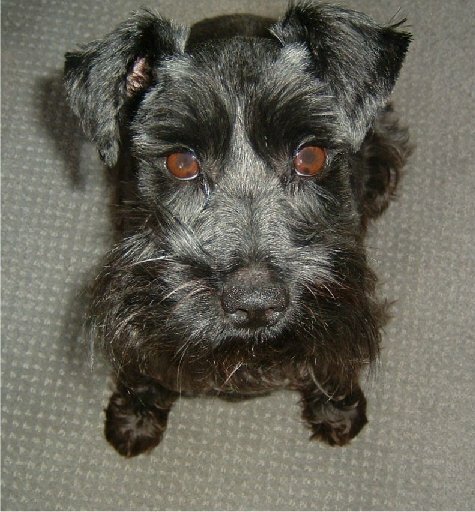 I do hope Sasha will bounce back and continue to fill your life with love. I must say this is the prettiest table setting I have seen in a while. So pretty in pink femininity, it must be pure joy for you to get to share this delightful setting with your mother (bless her heart). The umbrella with the rose garland is my favorite here. It certainly sets the mood for a girly afternoon of conversation and sharing. Ooh that hot pink is so stunning! Isn't it funny that it started to rain? What a fun day to spend with her and the darling boot manicure set is just too adorable. 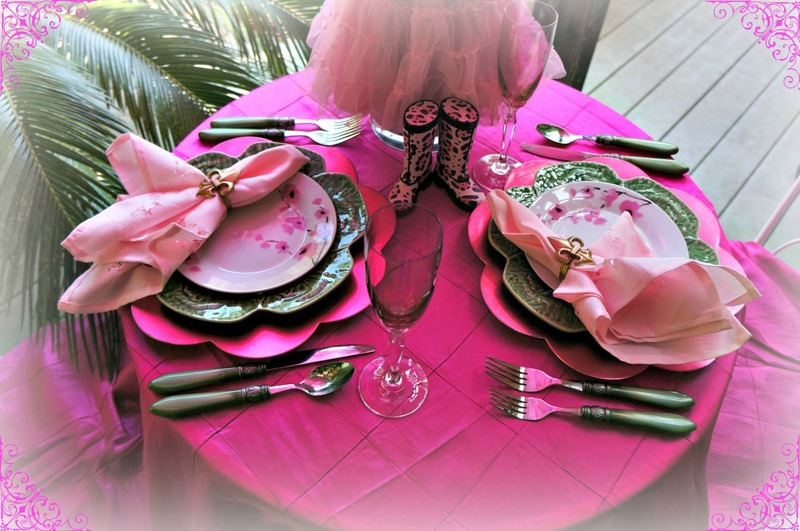 Such a cute and creative table...love all the pink! Every time I see a beautiful tablescape of yours I think about how much fun it would be to join one of your parties. You always make it so special with your attention to detail and the festive atmosphere you create. This is perfect for your beautiful weather and I bet your Mom was thrilled! What a sweet fur baby you have. I hope she continues her recovery as I know how it is to have a pet hurting. They become such a part of our families don't they? Love how you used the boots as a favor - how fun! Oh, Linda! Prayers for little Sasha. These little fuzzy faces do become our children and own a big piece of our hearts! Glad that Sasha is doing better. Gorgeous table setting for you and your mom, how sweet! I love banana pudding, what a treat!